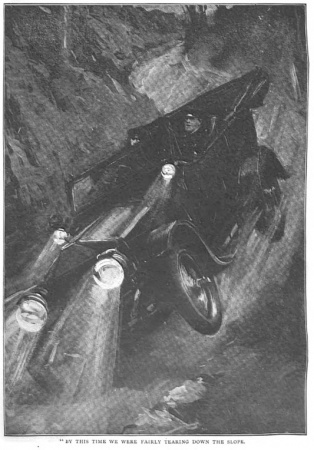 How It Happened is a short story written by Arthur Conan Doyle first published in The Strand Magazine in september 1913. The story have been adapted to stage by Conan Doyle and Percival Wilde as Dawn performed in 1914 in New York (USA), and to screen in 1925-1926 in the silent movie How It Happened. "By this time we were fairly tearing down the slope." 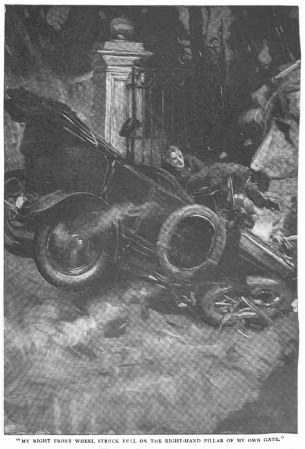 "My right front wheel struck full on the right-hand pillar of my own gate." I can remember some things upon that evening most distinctly, and others are like some vague, broken dreams. That is what makes it so difficult to tell a connected story. I have no idea now what it was that had taken me to London and brought me back so late. It just merges into all my other visits to London. But from the time that I got out at the little country station everything is extraordinarily clear. I can live it again—every instant of it. I remember so well walking down the platform and looking at the illuminated clock at the end which told me that it was half-past eleven. I remember also my wondering whether I could get home before midnight. Then I remember the big motor, with its glaring headlights and glitter of polished brass, waiting for me outside. It was my new thirty-horse-power Robur, which had only been delivered that day. I remember also asking Perkins, my chauffeur, how she had gone, and his saying that he thought she was excellent. "I'll try her myself," said I, and I climbed into the driver's seat. "The gears are not the same," said he. "Perhaps, sir, I had better drive." "No; I should like to try her," said I. And so we started on the five-mile drive for home. My old car had the gears as they used always to be in notches on a bar. In this car you passed the gear-lever through a gate to get on the higher ones. It was not difficult to master, and soon I thought that I understood it. It was foolish, no doubt, to begin to learn a new system in the dark, but one often does foolish things, and one has not always to pay the full price for them. I got along very well until I came to Claystall Hill. It is one of the worst hills in England, a mile and a half long and one in six in places, with three fairly sharp curves. My park gate stands at the very foot of it upon the main London road. We were just over the brow of this hill, where the grade is steepest, when the trouble began. I had been on the top speed, and wanted to get her on the free; but she stuck between gears, and I had to get her back on the top again. By this time she was going at a great rate, so I clapped on both brakes, and one after the other they gave way. I didn't mind so much when I felt my footbrake snap, but when I put all my weight on my side-brake, and the lever clanged to its full limit without a catch, it brought a cold sweat out of me. By this time we were fairly tearing down the slope. The lights were brilliant, and I brought her round the first curve all right. Then we did the second one, though it was a close shave for the ditch. There was a mile of straight then with the third curve beneath it, and after that the gate of the park. If I could shoot into that harbour all would be well, for the slope up to the house would bring her to a stand. Perkins behaved splendidly. I should like that to be known. He was perfectly cool and alert. I had thought at the very beginning of taking the bank, and he read my intention. "I wouldn't do it, sir," said he. "At this pace it must go over and we should have it on the top of us." Of course he was right. He got to the electric switch and had it off, so we were in the free; but we were still running at a fearful pace. He laid his hands on the wheel. "I'll keep her steady," said he, "if you care to jump and chance it. We can never get round that curve. Better jump, sir." "No," said I; "I'll stick it out. You can jump if you like." "I'll stick it with you, sir," said he. If it had been the old car I should have jammed the gear-lever into the reverse, and seen what would happen. I expect she would have stripped her gears or smashed up somehow, but it would have been a chance. As it was, I was helpless. Perkins tried to climb across, but you couldn't do it going at that pace. The wheels were whirring like a high wind and the big body creaking and groaning with the strain. But the lights were brilliant, and one could steer to an inch. I remember thinking what an awful and yet majestic sight we should appear to anyone who met us. It was a narrow road, and we were just a great, roaring, golden death to anyone who came in our path. We got round the corner with one wheel three feet high upon the bank. I thought we were surely over, but after staggering for a moment she righted and darted onwards. That was the third corner and the last one. There was only the park gate now. It was facing us, but, as luck would have it, not facing us directly. It was about twenty yards to the left up the main road into which we ran. Perhaps I could have done it, but I expect that the steering-gear had been jarred when we ran on the bank. The wheel did not turn easily. We shot out of the lane. I saw the open gate on the left. I whirled round my wheel with all the strength of my wrists. Perkins and I threw our bodies across, and then the next instant, going at fifty miles an hour, my right wheel struck full on the right-hand pillar of my own gate. I heard the crash. I was conscious of flying through the air, and then—and then —! When I became aware of my own existence once more I was among some brushwood in the shadow of the oaks upon the lodge side of the drive. A man was standing beside me. I imagined at first that it was Perkins, but when I looked again I saw that it was Stanley, a man whom I had known at college some years before, and for whom I had a really genuine affection. There was always something peculiarly sympathetic to me in Stanley's personality; and I was proud to think that I had some similar influence upon him. At the present moment I was surprised to see him, but I was like a man in a dream, giddy and shaken and quite prepared to take things as I found them without questioning them. "What a smash!" I said. "Good Lord, what an awful smash!" He nodded his head, and even in the gloom I could see that he was smiling the gentle, wistful smile which I connected with him. I was quite unable to move. Indeed, I had not any desire to try to move. But my senses were exceedingly alert. I saw the wreck of the motor lit up by the moving lanterns. I saw the little group of people and heard the hushed voices: There were the lodge-keeper and his wife, and one or two more. They were taking no notice of me, but were very busy round the car. Then suddenly I heard a cry of pain. "The weight is on him. Lift it easy," cried a voice. "It's only my leg!" said, another one, which I recognised as Perkins's. "Where's master?" he cried. "Here I am," I answered, but they did not seem to hear me. They were all bending over something which lay in front of the car. Stanley laid his hand upon my shoulder, and his touch was inexpressibly soothing. I felt light and happy, in spite of all. "No pain, of course?" said he. "There never is," said he. And then suddenly a wave of amazement passed over me. Stanley! Stanley! Why, Stanley had surely died of enteric at Bloemfontein in the Boer War! "Stanley!" I cried, and the words seemed to choke my throat— "Stanley, you are dead." He looked at me with the same old gentle, wistful smile. "So are you," he answered. This page was last edited on 12 August 2017, at 14:45.